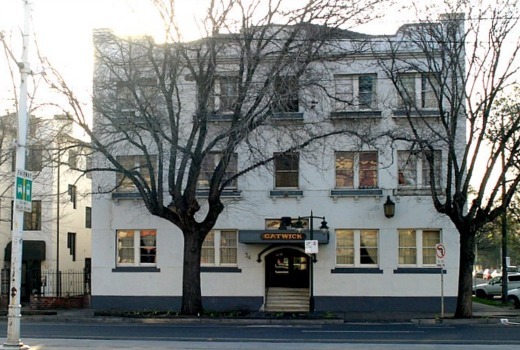 The Block producers have been looking at notorious St. Kilda site The Gatwick Private Hotel in Fitzroy Street as a possible site for its next season. But the pricetag, believed to be over $11m, is proving to be a sticking point. The 64-room 1930s building has been a low-cost boarding house since the 1950s, owned by twin sisters Rose Banks and Yvette Kelly. It has a reputation for its colourful, residents, but is considered unwelcome by many nearby businesses. The boarding house has been the scene of murders, drug raids and stabbings. It has been described as a “festering flophouse”, “flea pit” and ” magnet for St Kilda’s down and out crooks”. Should a sale proceed the state government will work with housing agencies to find alternative accommodation for the residents. TV Tonight understands The Block producers, known for choosing distinctive properties, have taken a look at the site. In 2015 they renovated South Yarra’s Saville Hotel, scene of a violent attack by a self-styled ‘vampire gigolo,’ into plush apartments worth up to$2.3m. The Gatwick Hotel also sits within the City of Port Phillip, the same municipality as the Port Melbourne site sold a week ago, and which has a good track record of welcoming production. After its rating success, The Block is returning in 2017 with production needing to get underway by Q2.